Due to my naive* interpretation of the feedback I received to last week’s edition, I’m back again with another reflective message. I want to echo Ben Lee’s (or is it Daffy?) sentiment – quite a group you have going here. I reconnected with Old Spice yesterday – we used to sleep through the same lectures at uni 30 years ago! Part way through week 2, I’m happy with progress, even managed a ride home last night with the 6pm bus, safely directed by Old Spice and Norman. From St Ives I rode with MRE along MV Rd and down Forest Way, then solo to Seaforth and finally home to Allambie. 45km! After taking a 25km route to work, I covered 70km yesterday – and didn’t hear those legs until I got home. To those ERs who ride under a male ride name (I’m assuming that is the females of our group) my apology for the sexist assumption underlying the alternate title for this week’s topic. I promise that next week’s ramblings will be more attuned to your tastes. The tips below come with no guarantee, and you can be pretty sure that if one approach works this week, it will not work next week. But I digress – back to psychology – that is you know which buttons set off your significant other. Money becomes a focus if we make it the focus. So let us just imagine that you have just seen your dream bike – imagine a shiny yellow and black 2012 BMC Cadel Evans signature edition – with your favourite number “34” on it. Unless the owner decides to let it go for $100, the price is likely to exceed you delegated (or single signature approved) authority. How can you justify the spend? FAIL – as soon as you start trying to justify the expense, you have lost. You save money on bus/train fares by riding to work. Once you have laid the foundation (over time) and you have demonstrated the benefits mentioned above (eg take your partner out on the money you have saved on fares and using the time you previously may have gone to the gym for a run) then you need to slip in the odd comment about servicing the bike etc. It should become part of the fabric of your household, just like getting the car serviced – but with the exception that your saved bus/train fares could never come close to the cost of car service – in fact there is another saving – you don’t need to drive to the station anymore, so you save on car servicing. I’ll leave it to you to work out all the possible benefits and justifications, but everyone knows that there comes a time with all cars, that you should get rid of it and replace it with a new or recent used car. If you have laid the foundations for success – replacing your bike will just become another expense in the household budget. Just make sure when you go shopping for a new kitchen, you don’t put the brakes on the budget – you always have to give the ultimate decision to the one who knows best – so if you talk about good value … you get where I’m heading yeah? For those who have read the whole of this perspective – you are a hardy lot. I’m a lawyer – you are not supposed to believe anything I say – basically the above is just a load of (^@#. So the most important thing is – make sure your mates are free for a BBQ (and know what to say) the weekend after you pick-up that new bike! Note: No guarantees – good luck – I know a good divorce lawyer. This entry was posted in Commute Reports on 31 January 2013 by Drastique. As newly (self-) appointed Press Secretary for our Spiritual Leader, Le Bullet, the Cycling Sadhu, it is incumbent upon me to chronicle his greatest deeds for the global audience and future generations. In this capacity I lay this short passage before you. Last Friday, for reasons known only to himself, the Good Shepherd Saint Navigation spruiked the running of the first Flambie, seizing upon the opportunity to welcome pink-jersey aspirant, Sam, with a ‘slightly more challenging’ way home than the sacred OTP. And so it was that, on a hot 32 deg, 95% humidity Friday afternoon, we turned right instead of the holy left at SHBN and in what can only be described as blasphemy we strayed from the Golden Path to the GG, that most sacred house of Friday afternoon fellowship & libation. Had it not been for the spiritual credentials of two of our crew I would have truly feared for my mortal soul. Our small band of heretics assumed a formation of sorts and rolled out – new girl Sam (ride name pending, I vaguely remember Bullet trialling ‘Cadel’), Bullet, SatNav, YHC and a homeward bound Mavis completing the quintuple. Through the back streets of Kirribilli, Neutral Bay, Mosman we weaved our merry way. No rush, a long weekend ahead, embracing the key tenet of OAFATSR. With lots to look at and chat about, and encountering many other cyclists in a similar mood, revelling in the holiday atmosphere. Down Parriwi and over the bridge we picked up a couple of GOTFR tokens from a passing STA bus clearly in a Friday afternoon fluster. Up Mont Seaforth at a slow and steady clip then the sprint along Pittwater Rd, SatNav demonstrating great SS skills with a mix of high cadence, drafting and crouching for max speed, the pilgrims arrived at the base of Mt Doom. A quick farewell to Mavis and YHC looked for signs of trepidation in the new recruit but was disappointed – Sam merely grinned, took firm hold the Specialized’s reins and got stuck into the climb. North of Frenchs Forest the group split further with SatNav and Bullet continuing north, Sam and YHC turning our steeds’ heads west to cross the much feared Roseville Speedway. Taking the advice of the Good Doctor Watsford, we erred on the side of caution and prudence and pulled our mounts onto the footpath for a couple of kilometres of windy, root-infested, debri-strewn, overgrown concrete before making it onto the bridge bikepath – no improvement here with large gaps between segments and open to the northerly cross-wind. All up a true bone rattler and not be repeated by any who care for their rims. After the bridge, back around, under, then up and out for a pinchy climb through the back streets of Castle Cove. Ciao to Sam, then a gallop on to Chatswood and back home to Artarmon for a hot shower and a cold beer. Total ride time about 2 hours and well past the previously agreed hour with the good lady requiring appropriate levels of genuflecting and contrition from YHC as penance. A small price to pay for yet another great Easy Riders adventure. Thanks again to SatNav for the inspiration and guidance. Strongly recommend the Flambie to all – a great complement to the Fluffer – get one or two of these in before daylight savings comes to an end. This entry was posted in Commute Reports on 28 January 2013 by Drastique. I have “survived” my first 2 outings with the “Easy Riders” – both Allambie returns. Sometimes I amaze myself at just how DUMB I can be !!! Shadowing Comet’s cry “wrecked” and Richard’s advice in response, I am today walking around without any legs (I can see them, but I can’t feel them). Are suffering some sort of guilt trip for which they need to punish themselves. Having made it to Corkery Cres on Tuesday, I promised to ride to the BP (Flers St) last night. Yay – downhill to my place (my home is at the first roundabout as you head up Allambie hill). did anyone notice I could hardly speak? do they know I really just went this way because it is easier? Arriving at the round about – we are ahead of the main road group by 50m – I told you it is easier up Sloane/Cornwell – I decide that the 50m head start will help me – but by the time I pass Goondari (only 200m up the hill), I’m near the back and by Earawy(50m later) – I’m simply dust – still 300m to Corkery and 1.5 km to the BP – seriously, am I stupid? I could be home now in my pool! See above – YES. As I pass the BP I can still see one Yellow and Red jersey ahead – I wonder where they re-group? I know they will not expect me anyway abd even if they do re-group, they will leave before I arrive – so I’ll just toddle along and turn around at the top – but why – I said I’d turn at the BP but I’m still going – my arms (remember, the parts of my body that only 15 minutes earlier were called on to help my legs) are completely unresponsive – they can’t muster the energy to turn the handle bars – so I’m stuck going forward – up Allambie Hill. At about this point, the flood of sweat teaming down my face is so great that my eyes are stinging from the salt and I have to remove my glasses to wipe – peddle, peddle, wipe, peddle peddle wipe etc etc. Wow – they do re-group – wow I’ve made it. Head: Don’t show pain, don’t show pain. MRE: Coming to Mona Vale Rd? Head: There is MRE – he is turning around – phew. MRE nurses me back to Forest Way shops. Crossed at the lights and along the footpath to go over Warringah Rd and the Parkway into the Aquatic Centre. Do you know how steep that hill is out of the Aquatic Centre up to Madison Way? Downhill home – what a ride. Head: Ow, pain! Jens Voigt, Jens Voigt. The only reason I rode in today is because I am getting way to tight in my old age to pay $3.60 for the privilege of sitting in a stinking bus going slower than I can ride (even with no legs). This entry was posted in Commute Reports on 25 January 2013 by Drastique. One man’s Rolls is another man’s muffin top. Is that what an Egg and Bacon Rolls looks like? Lady Penelope: Look Parker – is that one of those Easy Riders? Parker: Yes M’lady I’m afraid it is. Lady Penelope: Is it… Brains? Parker: No M’lady, I believe those that know him well call him Virgil… or something of that nature – although perhaps not to his face. My vote is for 8. This entry was posted in Non-ride Reports on 21 January 2013 by Drastique. …… a little country and western. Coz that’s what you are. This entry was posted in Best Of, ER Poetry on 18 January 2013 by Bullet (Le). Thanks to all 11 of the Flufferers who attended the Birthday Fluffer this morning. We have 4 Virgin Flufferers including our youngest Flufferer to date – Grant aged 14. No mechanicals to report. Flufferettes were on great form (Briony and Anna Banana). The Sunrise and views were all delivered on schedule along the beaches – Thanks for booking these. A little bit untidy today in the Group Riding but that’s because we were partying hard and enjoying ourselves. Graham organised the Birthday procession into the B&T right on schedule with a 7.45 delivery. Great timing. Well done. Ravi bought the Birthday drinks – thanks mate. All Flufferers welcomed by the OTP – Thanks for all the ‘Happy Bird Day’ messages – Go Fluffer your feathers today and enjoy a wonderful day. Fluffers organised every Tuesday and Thursday – 5.15 start at St Ives – Next Birthday Fluffer Procession is 14 Feb. Let me know if there is a Birthday on a Tuesday or Thursday before then with an intended Fluffer. This entry was posted in Commute Reports on 17 January 2013 by Drastique. Much frivolity and jocularity happening on the launch pad, holiday atmosphere but undertones of business as usual, how fast those heady days of alcohol and family rows recede to make way for three peaks training and superhuman basecamp training..base meaning peak in cycling parlance. YHC is still confused sometimes as “base” training entails peak training..and YHC is always base and wanting peak..no matter where in the continuum..perhaps there is an unwritten rule about where in the line between base and peak one actually “is”..Professor has YHC missed a chapter in the explanation of “non event” appreciation, or just eaten one or two of Schleckies “brownies” for breakfast…it is all too beautiful man…??? 20…on the pedals to ply the OTP, names and addresses to follow, greeting to “newbie” Greg, from Dural ( meaning the Dural Chapter has expanded by 100% in the first month of the new year )…and a slow wind up into the hills of death..the first point of safety to discuss was YHC..first roundabout, Ute approaching from the right , YHC jammed on the ancors but only managed zero braking and had to commit to riding through the roundabout hoping the ute was able to stop and give way…I was not travelling fast but had no chance of stopping on the slick road with ‘gatorskin slicks..simply no grip..
Luckily no sticky ending but lesson again on wet road considerations. Traffic has definitely increased, and once into Roseville we were overtaken by a car intent on breaking road rules ..possible frustration due to peloton size but no excuse for dangerous driving..ignored the double whites and mashed into the peloton when meeting oncoming traffic..could have been messy but again thankfully no injuries to report..there are now nice cycle symbols stencilled on the road to alert the road user to the danger of cyclists but it seems that 15 seconds of delay is not acceptable to some. Archer St lights did their thing and chopped the 24 strong group into sections of about 6 ..regrouping at Tindale, again the moist conditions making the surge into the park and shared path a possible health hazard..but one ER has mastered with sensible precautions taken..slow speeds and single file, much vigilance to ensure all arrive in one piece..( and no pillory in the SMH due to the predatory practices of the “lone” cyclist ) ..YHC slipped to the Lantern Rouge position to ensure that Greg made it up Scaramanga and would know where the KOM line is, unfortunately by the time he arrived up to the carpark, his hypoxia was such that he rolled over the footbridge, and could not hear YHC calling for the right turn ..he rejoined the group on West St, having found some oxygen on the freeway section. Great to see such enthusiasm and vigour on show, enough to encourage the other 180 on the list to make an appearance in the near future..
Returns all teed up and ready for the usual times.. This entry was posted in Commute Reports on 14 January 2013 by BT. On the hottest day of the year so far the intrepid Flufferer’s conquered yet another ride without a mechanical between them. 9 riders in total – Anna, Alex, Ravi, Blue Stratos, Andy H, Sam, Simon, Sir Lunchalot and Big Goaders (think I got everyone right). A stunning ride by all involved with regular regroups on the first part of the ride at the Terry Hills Turning, The bottom of the big drop in the National Park and just before we hit the main Mona Vale road. Pace was as fast as the slowest rider with calls that ‘The Back’ is now the ‘New Front’ where all the conversation, fun and banter happens. The ride was Hot with a fully diverse team! Simba – still missing you in your pink!!! The Captain would have been proud of us – down the 15km of bus lanes we were practising our ‘rolling groups’ where the average speed was 32km per hour due to the amount of drafting going on – effectively we got a ‘free 10km/h’ from working as a team in a closely nit group – lots of changes occurring with military precision. Great fun and great effort. Well done and thanks to all involved. By the time we hit Manly Sir Lunchalot felt hungry and targeted a $1.5million tuna seen closely offshore. Running down the beach like Daniel Craig he quickly dived in supported ably by Blue Stratos. Unfortunately missed the Tuna but had a fantastic swim. 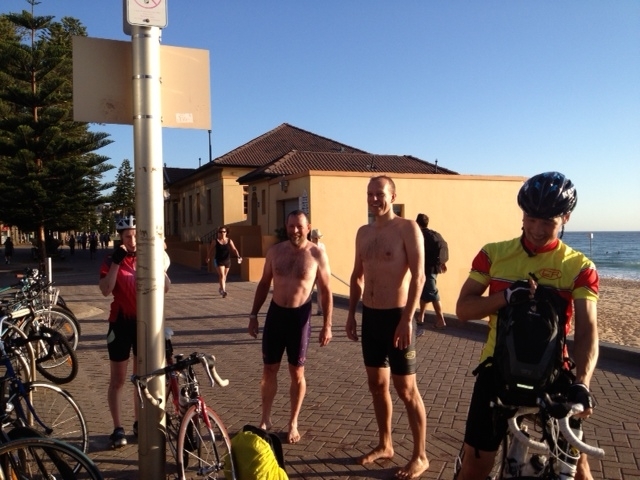 Enjoyable ride from Manly with a good climb from Spit bridge, through Mosman and over the Bridge. Joined by the Flutterers just short of North Sydney which was great that they rode in with us rather than just whizzing past us with a wave. Great effort by all. An enjoyable ride. This entry was posted in Commute Reports on 8 January 2013 by Drastique. I acknowledge the traditional owners of this email and give thanks for allowing me to commune in this sacred place. I can feel their presence. Australian Property Monitors report this morning a sharp spike in interest and value of postcodes 2070-2075 citing “The appearance of the Captain” as the overriding influence. Local investors and owner occupiers were out in force to see this rare cyclical phenomenon in action, as such factor convergence in market conditions is far too rare these days. That said, 30 of the 2070-2075’s most attractive offerings were on display this morning. For many it was their first foray into the market this year, for others it was the hope of a more buoyant times after the sluggish conditions of the previous week. Captain’s evergreen stunner – “Rolling Downs”, the perfect combination of ease, with just a hint performance. Luxury and delusion in perfect concert. Shleck’s classic Art Deco – “Moneypenny”. The impressive property has been let go in recent times; the hedges are a little overgrown, all of which adds to the mystery of this top drawer offering. Insiders note a recent garage sale of certain fixtures and fitting suggest that the Schlecks may be more motivated than first indications. Potential for good buying here. Chippo’s compact entertainer – “Nads”. Crisp, clean presentation with bright colours that create an ambience of fun and functionality. A lot of value has been squeezed into this appealing unit. If you poke around inside you’ll find hidden nooks and private spaces to please. This one’s a real peach! With stock numbers on the rise, many are looking for expansion opportunities to new developments and undervalued opportunities; Flufferville, Aallambie-by-Sea, and Getalong Grove all attracting early season interest. Tomorrow sees up and coming agent – Goader Partners, testing a bold marketing innovation – a pre-dawn tour through Flufferville. Expressions of Interest have been strong with many hoping to get the jump on the market and snap up a bargain off the plan. It’s shaping up to be quite a year and we’ll be looking to set records, maintain high clearance rates and continue the stimulate the market with interesting and attractive offerings from the FM group of companies. 5.15 & 6pm briefings as per. This entry was posted in Commute Reports on 7 January 2013 by Bullet (Le). A great weekend of riding, and from reading the reports we’ll make it to the moon and back this year..
YHC was hit by a sudden rush of blood to the head and made a seemingly rational decision to ride the Fondo..Wisemans loop with the Boy , George and Wiggo. A cool 20C at 6:30 rendezvous, George and Wiggo had already conquered GG , but the Galstone shops was a logical spot to start, and thus it for YHC it would also be a tortuous finish.. The ferry across to the dark side, ( as the hill shadow provides a delicious shade from the gathering heat ) and a “gift of the road”..George found a spark plug spanner for his whipper snipper..yup sometimes these things just appear and you just say thank you. Once back in the groove, next stop Spencer, signpost says 25kms, but the further from the city you go the length of a km stretches..everywhere seems to take ages to reach, luckily Spencer is announced at about 10kms from Wisemans, and then you do another 15km to reach the village shops, at which there is perfect little cafe for a stop and refresh..cyclist special , coffee and bacon and egg roll for $8..and a happy snap for their facebook page..YHC merely indulged in a chocolate milkshake, but when combined with 2lts of water..$8.40. The serious climb out of the Hawkesbury valley begins a little way further down the road, temp just nudging 30C at the start, and still in a little shade, but the higher up the slope once clear of the trees and into chook hell..( pong of factory farmed chooks is quite overpowering )..temp climbed to 34C and our happy band gritted their teeth and pedalled on..( Party political broadcast..factory chook farms are just plain wrong, designed and implemented with ruthless efficiency and tellingly are the only farms I know of with 8ft chainlink wire fences with razor wire on the top..when they open the vents in warm weather, the stench is but one manifestation of the evil within) PPB over …Mangrove mountain..aptly named, and relief found at the Corrugated Cafe on Peats Ridge Road..George now counting down the kms to home, 50 to go ( for him ) YHC another 70, nothing that a strawberry milkshake can’t fix..and coffees for the Boy and George, The Boy making this ride look easy, or maybe he just doesn’t sweat. 35.6 C on the Mt White section, George calls this “undulating..” also point of order, never ask George if a section contains a hill, he has no recollection of anything with an incline, for him the world is flat. Some flat sections you can ride without pedalling and go very fast some other flat sections you have to pedal a bit hard to keep going at a normal speed. Pie in the Sky and for YHC the dream was nearly over, but the road was still long…a quick recovery Gatorade..and back into the heat but now it is the homeward leg, and familiar territory makes it not feel so bad, so the section to Mt Colah sped by in no time, You could hear the beers in Georges fridge calling ( but that would be a siren song to YHC ..GG with a beer in the legs..) He peeled off with grin and gusto, Boy and YHC pedalled on..Boy was headed to collect a car..Normanhurst..( no GG for him then ) but YHC made that right turn and set off with as much bravado as could muster for a gritty little climb out and home.. If it is not on strava it didn’t happen…thankfully a full and frank report uploaded with PBs and words like “Extreme” used to describe what was in fact a very enjoyable day ..many thanks to Mike, Boy and George. This entry was posted in Other Ride Reports on 6 January 2013 by BT.